Leading Exporter of moisture analyzer balances from Mumbai. 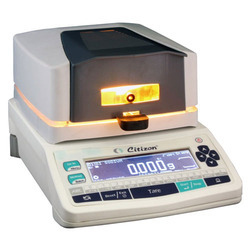 We have Moisture Analyzer Balances with HALOGEN Heating is mainly designed on the basis of time saving Factor for universal use in Chemical & Pharmaceutical,Oil,Petroleum Industries also in material testing & Environmental Laboratories & in sewage treatment plants. Facility of compile two method. Data memory up to 1000data. Data can be divided in to 40 methods or 100 batches. User can avial Statistics method or batch wise. PS2 Key board connectivity make it very user friendly operation. Looking for Weighing Scales & Balances ?